Today, exactly a year after posting about our little one’s first spoons, let me tell you about the family dinner experiment that we started when Birdy was 10 months old. After the extremely detailed instructions uniformly provided by everyone from German pediatricians to German baby books on what, when & how a baby should fed from the age of around 4 months (read more in this post), I was puzzled by the deceptively simple recommendation beginning at from the age of 10-12 months: transition to family meals. In hindsight it sounds silly but, following a half years’ indoctrination on baby meals as something with recipes that are precise to the gram and whose ingredients are determined by charts, the absolute freedom implied by the term “family meals” felt somewhat scary and confusing. All of a sudden we were supposed to give her anything we eat ourselves? No more cooking for the baby? 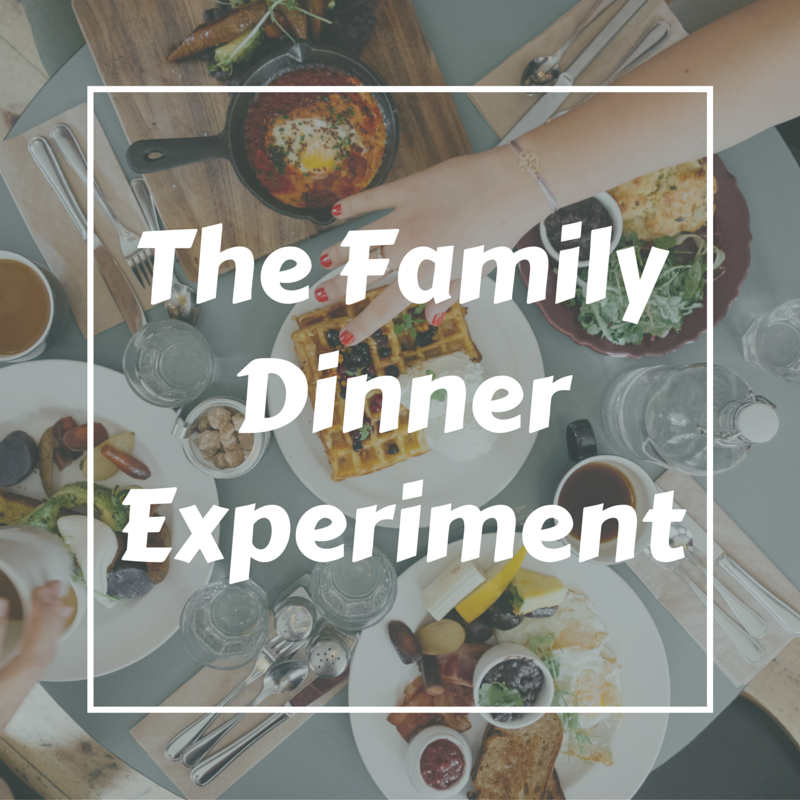 We began the family dinner experiment back in January. Birdy had just turned 10 months old, her first upper teeth had just broken through, and hubby had the week off – it was the perfect time to start. In the first week of our family dinner experiment we tried roasted vegetables, pasta with homemade tomato sauce, pancakes, and salmon with potatoes and green beans. Birdy certainly liked to fully participate in the meal, up until then she had just sat with us while nibbling on a snack. Her eagerness to try everything out was matched only by the mess that was left in her wake. How are you going to determine whether each piece of pasta or each bean pod tastes the same if you don’t take a bite out of each and throw the rest of it on the floor? In those first weeks we were often joking that our toddler has the table manners of a viking. Me being me, of course I had to get some more information on the strange new world of family meals. So I ended up participating in a class at the local “parent school” (Elternschule) that was basically a Q&A session about the topic of transition to family meals lead by a pediatrician. The approach the doctor was suggesting was not unlike that of baby led weaning (with the notable difference that it is started much later). The idea was that the little one should be gradually introduced to the food that the family normally eats, which is of course completely individual to each family. Everything that you eat yourself is allowed for tasting with the notable exceptions of very spicy food and raw honey as it can land a baby under the age of one in the hospital. The pediatrician also warned to be careful about the sugar content of such seemingly innocent items as fruit juices and flavored yogurts. Armed with all this information, I went home and could not help but ponder about the compatibility between my cooking and that what Birdy had been eating until then. I don’t believe in reduced fat products which is good as toddlers need the fats from products such as milk and butter. I’m also a notorious under-salter besides we switched to sea salt years ago, so no changes there either. One adaptation that I felt I needed to make concerned sugar. I find that most sugar substitutes taste horrid, besides in this household we mainly use sugar for baking and nothing else. That said, I have a serious sweet tooth – a run of grocery shopping is incomplete without stopping by the bakery for a Franzbrötchen, and there is a shelf in our living room dedicated to all sorts of chocolates, cookies, and other sweets. The question was, are these habits something I want to pass on to my daughter? So I’m making concessions. The flavored yogurts have been replaced by plain ones that I sweeten with fruit or honey. I’m experimenting (quite successfully) with reducing sugar in baking or partially replacing it with applesauce or bananas. And I don’t buy any pastries that I’m not willing to share with the little one. Over half a year in the family dinner experiment is running fairly successfully. Although Birdy doesn’t always eat everything that’s put in front of her, she usually finds at least one or two things that she likes. The preferences, however, are often changing and full of surprises. One night she might snub the pasta-spinach gratin which I was sure she would like, and the next evening surprise me by gobbling down the sweet potato and red lentil soup spiced with garam masala and curry. She loves both fried Asian noodles and hearty Latvian stews, and lately potatoes with cottage cheese are met with a favor equal to the beloved pasta and tomatoes combination. The nights when I need to cook an extra milk porridge before bedtime are getting more rare, but there are still times when I feel that she needs a little extra something to supplement the family dinner. I have a few months to think about this step in my daughter’s growth. BUT I am a bit nervous with the first step “veggies and fruits”… Yes, even if it’s my third kid. I always wonder what to introduce, what to cook, what to buy… I will look at your post about the “first spoon”. Asking moms from different countries what the first foods for their babies helped me to take a more relaxed approach to the whole issue of introducing solids. There are so many different approaches and the babies handle everything perfectly fine no matter if they start with carrots, rice cereal, or mangos and avocados.